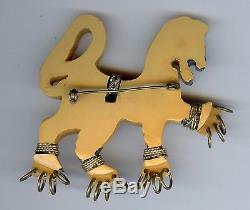 This wonderful vintage Bakelite lion pin has rope and brass details. It measures approximately 2-7/8" by 2-7/8" and weighs 26.4 grams. This is guaranteed all original 1930s brooch. Tests positive for Bakelite with Simichrome. 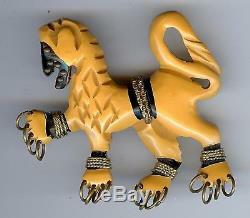 The item "FABULOUS LARGE VINTAGE CARVED BAKELITE HERALDIC LION BROOCH PIN" is in sale since Monday, June 11, 2018.